This season presents some unique health risks, some of which can affect your heart. Winter heart health is not something most people have to worry about. But if you’ve got high blood pressure, cardiovascular disease, or other heart attack risk factors, this season may be more challenging than others. The winter environment is what poses the threats. 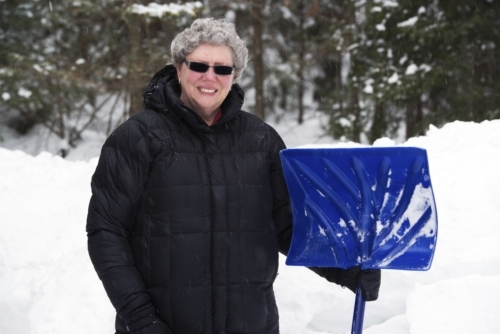 Shoveling the driveway or clearing snow, for example, requires a certain degree of physical fitness and if you’re typically sedentary, this activity can put a lot of stress on your heart. It’s also not uncommon for people with heart disease to experience chest pain (angina pectoris) in cold temperatures. Hypothermia is another health risk that’s unique to winter. The key to staying warm and healthy in winter involves layering up, being patient, and paying attention to what your heart is trying to tell you. Let’s go over some winter health tips to keep in mind. Many people with cardiovascular disease experience angina pectoris in cold temperatures, so monitoring your chest pain is important. When it hits, take a moment to sit down and rest until it passes. If it’s an unusual symptom for you, seek urgent care or emergency assistance. If you are interested in engaging in more activity this winter, start slow and acclimatize yourself to light activity before bringing your heart rate up. My father-in-law does a little routine of walking around the block once or twice before he shovels his snow. Gets him warmed up for the heavy work, he says. And I think it’s something everyone should do! Keeping the temperature in mind is very important. If you’ve got cardiovascular disease or high blood pressure and find yourself warm, it’s very easy to under-dress this winter and increase your risk for hypothermia. This is also true for elderly individuals with low levels of body fat and who might not be able to necessarily feel the cold. Hypothermia occurs when your body cannot produce enough energy to keep your internal body temperature warm, and it can ultimately kill you. Your vital organs need energy to perform their functions, and when the heat is taken away, they slow right down and produce symptoms like poor coordination, confusion, slowed reactions, shivering, and sleepiness. So, avoid this particular hidden danger; if you’re heading outdoors this winter, whether to the grocery store or for a long walk, then layer up. This is the best way to keep heat from escaping and to limit the amount of heat lost from wind and moisture. Layering up is important, but so is having a plan. When you get out there to shovel snow, for example, don’t push too hard. Schedule yourself enough time to take care of the work or do it in shifts (do half in the morning and half at night). Don’t rush through it. Take breaks when needed and allow yourself adequate rest. If your neighbor has a snow blower, perhaps ask them for some help. If your heart condition is serious enough or you have a large property, you should hire a neighborhood kid to take care of the snow shoveling for you and get your winter activity in milder ways, like going for a walk. Me, I used to like to warm up after chucking snow out of my driveway with a nice spiked hot apple cider. It’s a satisfying reward for completing the job. But I found out that avoiding alcohol immediately after (or before) shoveling can also lower my risk of a heart attack. So take this tip seriously. Wait a few minutes, cool off, drink some water, and then have one drink if you like. It’s all about the timing. If you have high blood pressure or cholesterol, it makes sense to keep an eye on it this time of year. Check your blood pressure in the morning about 30 minutes after you’ve woken up, but before breakfast. If it’s looking a little higher than normal, it may be worthwhile to delay any big projects you have for the day—like decorating or snow shoveling. You can check it again later in the day—in fact, looking two or three times per day during the winter is recommended—and call a family member if needed. Remember to relax for about 20 minutes prior to a blood pressure reading. And if you’re performing some outdoor work and feel your heart beating a little too quickly, take a rest. The weather can make it enticing to stay inside on the sofa, but aiming for some exercise every day can help keep your heart healthy. Even if you can’t get out for a run, take a walk or head over to the gym or community center to do some exercise. Again, shoveling the driveway counts, too! And if you do want to go out for a walk or jog, make sure you’ve got the right attire to keep you warm, visible, and sure-footed. Aerobic exercise can help keep your heart healthy in the winter, and you don’t really need to do much at all. Try to go for a walk (or brisk walking, if you like) at least once per day, totaling about 20 to 30 minutes. You can break these up into shorter walks as well! You can also go to your local gym or community center to participate in swimming classes, spinning (cycling) classes, or any other form of activity that encourages heart health. If you enjoy running in the winter, I’d advise doing it on a treadmill to avoid the extra risk of slippery surfaces and darkness. If you do choose to run outdoors, make sure you’ve got the proper equipment to supply traction, warmth, and visibility. And if you’re feeling up to it, helping your neighbor with their driveway is good aerobic exercise, too! Weight training can also promote long-term heart health while making you stronger to handle the additional weight supplied by winter snow. Weight training can also promote a faster metabolism, stress relief, and work to keep weight in check—all important components for a healthy heart. The gentle exercise form called tai chi, where participants move through a range of movements promoting focus, breathing, relaxation, strength, and mobility, can also aid heart health. Studies have shown that practicing this form ancient Chinese exercise can improve cardiovascular conditions including heart failure, high blood pressure, and coronary artery disease. You will likely find tai-chi classes at your local community center. Cold temperatures can lead to some serious health challenges—but being aware of them is the best form of prevention. You can maintain your heart health this winter by being patient and not overexerting yourself. Although you may want to power through the driveway, it might not be the best idea quite yet. Thankfully, by monitoring your heart rate and doing activities like aerobic exercise and weight training, you’ll build better endurance that will make the shoveling much easier as the weeks pass. In the meantime, stay warm, layer up, and listen closely to your body this season. “Cold Weather and Cardiovascular Disease” American Heart Association, July 31, 2015; https://www.heart.org/en/health-topics/consumer-healthcare/cold-weather-and-cardiovascular-disease, last accessed December 10, 2018. “Tai chi: A gentle exercise that may help heal your heart” Harvard medical School, August 2015; https://www.health.harvard.edu/exercise-and-fitness/tai-chi-a-gentle-exercise-that-may-help-heal-your-heart, last accessed December 10, 2018.